Please click on images below to view enlargements. 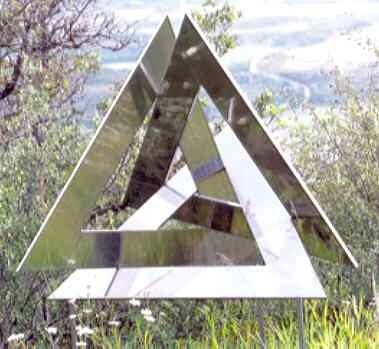 Ronnie Brown of the School of Mathematics, University of Wales, Bangor, gave a public lecture called "The Symbolic Sculptures of John Robinson: Geometry, Values, Forms and Structures"
George Odom and M.C. Escher"
John Robinson's sculpture FIRMAMENT was given to Professor Coxeter as a birthday present from Robinson by Ronnie Brown at the Fields Institute. 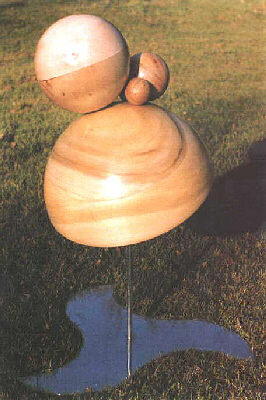 The top sphere comes apart into two halves and now contains Donald's letter to John describing the mathematics of the sculpture. 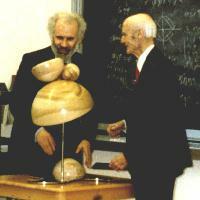 The sculpture was later donated by Professor Coxeter to York University.